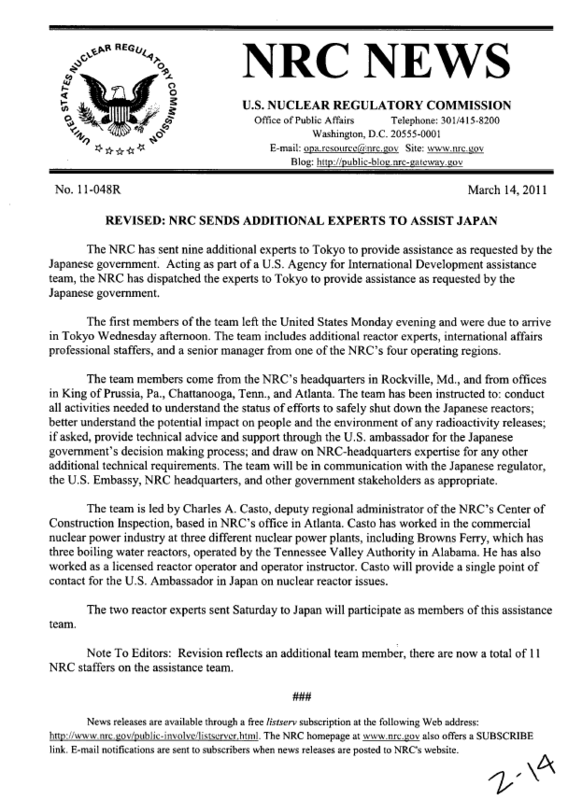 The NRC has sent nine additional experts to Tokyo to provide assistance as requested by the Japanese government. Acting as part of a U.S. Agency for International Development assistance team, the NRC has dispatched the experts to Tokyo to provide assistance as requested by the Japanese government. The first members of the team left the United States Monday evening and were due to arrive in Tokyo Wednesday afternoon. The team includes additional reactor experts, international affairs professional staffers, and a senior manager from one of the NRC’s four operating regions. The team members come from the NRC’s headquarters in Rockville, Md., and from offices in King of Prussia, Pa., Chattanooga, Tenn., and Atlanta. if asked, provide technical advice and support through the U.S. ambassador for the Japanese government’s decision making process; and draw on NRC-headquarters expertise for any other additional technical requirements. The team will be in communication with the Japanese regulator, the U.S. Embassy, NRC headquarters, and other government stakeholders as appropriate. The team is led by Charles A. Casto, deputy regional administrator of the NRC’s Center of Construction Inspection, based in NRC’s office in Atlanta. Casto has worked in the commercial nuclear power industry at three different nuclear power plants, including Browns Ferry, which has three boiling water reactors, operated by the Tennessee Valley Authority in Alabama. He has also worked as a licensed reactor operator and operator instructor. Casto will provide a single point of contact for the U.S. Ambassador in Japan on nuclear reactor issues. The two reactor experts sent Saturday to Japan will participate as members of this assistance team. Note To Editors: Revision reflects an additional team member, there are now a total of 11 NRC staffers on the assistance team.